I’m quilting again – well technically I’m piecing quilt tops together again. 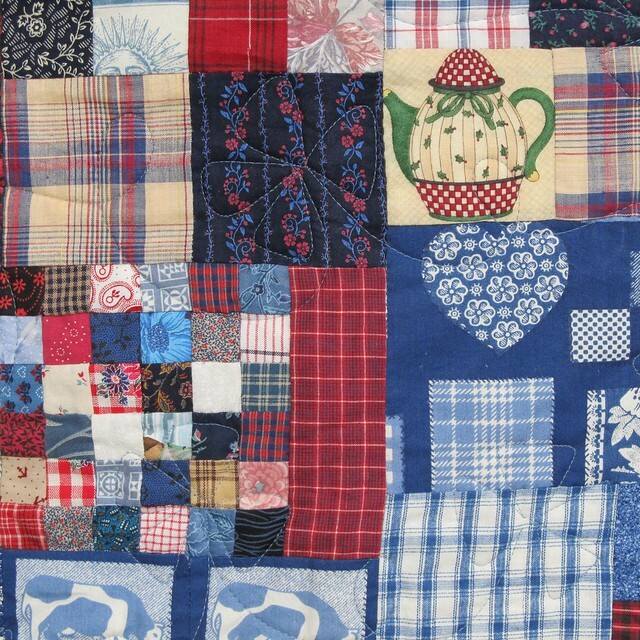 I leave the actually quilting – the sewing of the top to the bottom with the batting in between – to someone else who has a long-arm quilting machine. The one in the picture above is finished and I’m just starting on two more twins for our Florida guest room. I had started it over a year ago but then other things got in the way – like photography and blogging and life. The pattern I’m doing now is Friendship Braid which seems quite appropriate for a guest room used by friends. I already cut lots of pieces and started sewing the pieces into strips but it is taking more work than I had anticipated. Pieces of the Friendship Braid quilt. As any quilter will understand, I soon realized I needed a few more pieces of medium blue because I’m going to need a lot more strips than… Well, maybe I never thought about how many I would need. The pattern is for a small size and doesn’t give information about a twin size. No problem, buying fabric gives me a better-than-coffee-and-chocolate-together high. I have even cut most of the new fabric into the required pieces so tonight I’ll start piecing again. I’m going to have to stay focused because granddaughter Emily is turning 13 this summer and today I promised her that I would make her a quilt after she decides on the pattern and the fabric. This is something I have ALWAYS wanted to do, and just never got around to it. Your quilts are beautiful. One day…..
lovely..you are still taking on huge huge jobs! congratulations to you dear fiend. another new day wih new opportunities. Very impressive. It looks lovely. Just love it…. So very beautiful. Such an art. I have never done any quilting but I think I might have to start. I adore the first one. I made my first quilts for my daughters’ beds. They were simple nine-patch. A good pattern to start with. I always admire people who can make quilt. The first one is beautiful, love the colors and the pattern. Thank you so much. I really like the log cabin pattern. It is fun to put together. Pat, I’ve always admired people who can quilt and create such beautiful works of usable art. Emily is a lucky young woman to be receiving one of your beauties. Never done it; but, these are lovely colors and a sweet pattern. How charming. I love how this person used what seems like a random design but one that hangs together nicely. Thanks for sharing.